Dwight Eisenhower, the 34th President and a Five-Star General of the United States, had a four-quadrant decision matrix. 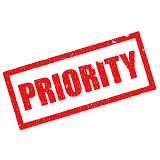 The categories were as follows: Important, Urgent, Not Important, and Not Urgent. Spending your time working on only important activities leads to living an effective life. Make decisions like a Five-Star General with the Eisenhower Decision Matrix. There are things that are urgent, but not really important. If something is urgent, that does not mean it’s becoming important.